A few weeks ago, we took a family vacay to Napa Valley, to celebrate a friend 's wedding, and then extended our trip into Sausalito. Ever do the wine country with babies...it's hard, but possible. We love Napa, I mean who doesn't...it's straight out of a movie, and I'll take all the vino and cheese platters please! Ready for take off...such a snuggle bug!! We arrived at the The Meritage Resort and Spa, super early...around noon. Actually, let me back up...I was up till 2:15 am, packing etc, even though I started at 6am, then slept for 1 hr and 30 min and headed to the airport. I normally wouldn't take such an early flight with the kids, but we booked a little last minute. I had learned from our last two trips to Palm Springs and Sedona, to start a day ahead, and well, now it'll be two days, for trips that require flying...tip for you mommas! I was a total walking zombie that first day. Yet, I was determined to keep pushing on, and try not to let the way I was feeling, ruin this beautiful day one. Travel style...cozy and getting to actually wear layers!! The resort was stunning, pulling in, I was like contemplating maybe retiring here one day...ha! I mean the weather was perfect too...in the 80's, and just gorgeous! We arrived early, so we had lunch at the Siena Restaurant. It was delicious...if you don't already know...I live to eat, soooo I'm always going to talk food with you guys!! We ordered 3 things to share...The Ahi Tuna and Watermelon, The House Made Ricotta and Tomato Jam, and the Chicken Gnocchi Carbonara. The most beautifully presented dish of seared tuna and watermelon salad arrived...and it was almost perfect...I prefer completely raw tuna, and I just missed the part about it being seared, which it clearly states...That 4 1/2 hours sleep, in 2 days, it what that was. But it was tasty and delish, and would have been pure perfection to my taste, not seared. The other 2 dishes tied for first place...I mean...So flavorful and beyond yummy...highly recommend! We scraped the ricotta jam literally, and the gnocchi was honestly hands down, my fave gnocchi ever!! Soooo good....and I loved the addition of chicken within, made it even more filling and rich...not sure why I've never had it that way. But literally nothing went to waste. Hartley had the pizza, and my hubby tasted and enjoyed hers as well..her palette is nothing like ours yet...ha! We actually survived a calm lunch with her...the whole time, I'm like let's eat fast, hurry before she gets crazy...ha...I mean she was sticking her hands in her water cup and pulling out the ice the entire time, but ugh...2 year olds...I can't wait till she can dine with us everywhere, without any wild kid moments, or screams...yikes. My hubby got their cabernet and I got their chardonnay. I like my chardonnay super buttery, so I did prefer his glass, which was pretty tasty. Loved our little room...we looked out onto the end of a vineyard on a hill. Loved the old world decor, which set the tone perfectly for Napa, and the shower was a full walk in and fantastic! Hartley showered all weekend with me and she loved it...I couldn't take one without her...she was obsessed, but luckily we are back to bath time at home. But seriously, I love a good bathroom at a resort! I'm never impressed with the showers very often, and this one...stellar...sometimes it's the little details, ya know! We brought our pack and play for Hartley to sleep in, and the hotel provided a pack and play for Grayson...little did we know, we would have a slumber party every night of this trip with our Hartley, and not need one of them. Seriously, be still my heart! I was like how are we ever going to go back to sleeping normal again. I had a slight fear, that I of course suppressed, about that first night home sending her back to her room. When we got home, no biggie, back to her crib she went. Such a trooper, not remotely an issue. With baby Grayson, it's so easy to stay on a sleeping schedule, but with Hartley, it's impossible to get her napping in the hotel room. Her schedule was so off and she would be up snuggling with me, while I worked past 11pm each night...yikes...but omg...such a dream...even the night her foot was on my face...ha...such a cutie...Can't wait for our next trip! The ultimate mom life/travel life....love having my babies right on top of me at all times. Loved that this resort had a coffee shop on the property. I went there everyday for sustenance...Ha!...Mom survival methods I swear! Hartley and I had the blueberry cheesecake every single day. It was perfectly decorated and so delish! It became Hartley's and mine tradition. We ate lunch there the second day as well...while my hubby golfed...and I had a lovely kale salad. I also loved our dinner that first night at the Crush Lounge. I absolutely loved this spot...they have a bowling alley and restaurant/bar right on site. We just went in to order food to go (life with a toddler...lots of ordering to go these days) but it looked like so much fun! This was actually my favorite meal, and I was so surprised it came from the lounge, because you wouldn't think so. Seriously thinking about it...I'm like starving! I had the Shrimp Ceviche Tacos and we split the Deviled Avocado, which was like a devil egg, inside half an avocado....yes just as amazing as it sounds...omg! Hartley had a super tasty grilled cheese and my husband the fish tacos, which were fantastic also. When you stay here, you will be missing out if you don't dine or order out from the lounge! We spent everyday at the kiddie pool. This was actually such a fantastic and unexpected feature. I think they have a condo residence attached to the property, and on that side are the kids' pools. They had a super tiny wading pool that Hartley could play around in, and an amazing splash pad...heaven...she was in heaven! She could have played there all day the whole trip...she was devastated to leave...of course...sweet baby. People were barbecuing on this side, that's why I think it might be residences that people also rent out, but not 100%. The only downfall, was the main pool didn't allow kids, and it looked amazing, and had food and drink service, which the kiddie pool didn't. It wasn't that large of a pool area, and I can see how they'd want to keep it adults only, an keep that vibe going over there. The kiddie section, definitely needed more chairs, lounges and umbrellas, and the same food and drink menu/service. We love to order food and drinks poolside...that's one of our things and we couldn't. It was a bummer that last day, when we couldn't join a bunch of our kid-less friends at the cool pool...ha! However, on a positive note, this was the largest kid friendly section I've seen recently at a resort, and we so appreciated having it there for our Hartley...she was living the dream! Baby bums...loved this splash pad here...this kept Hartley soooo busy, and we had fun with it. Had to include one of these...this little boy kept coming up to her...her face cracks me up...right after, she climbed out...ha...too close too close! We were in Napa to celebrate my husband's good friend getting married, and it was a traditional Indian wedding and phenomenal! One day they had henna by the main pool, and I got a fun henna tattoo on my hand for the celebration. The wedding had so many beautiful and lovely traditions, and everything was about dancing and celebrating...it was seriously so much fun. The first night, the Sangeet, was a blast, and Hartley loved learning and dancing Bollywood! We had so much fun and the food was so good...traditional Indian food. Now I need to find a good place by me, and order up. The first time I bought matching outfits for the girls from my favorite company!!! Be still my heart, and seriously this was the best pic we could get...Omg it's so hard to get my Hartley to focus for a pic, kind of makes you want to cry a tad..so much goes into getting to this moment and then well nope...HA...Busy little baby! Obsessing over this easy dress...linking everythign below...so much easy to take a pic solo...ha! The gorgeous bride at the Sangeet (obsessing over her dress) and my stunning girlfriend, almost 4 months pregnant with twins...so much to celebrate! The wedding itself started with a procession of the groomie on a horse, and there was dancing and music and singing, and it was fabulous. The ceremony location was above the cave, at the start of the vineyards and gorgeous. We later dined within the cave in this long arched galley. It was so beautiful in there. I didn't want to share too many pics of their wedding, since this is a personal blog and not sure if they'd want their beautiful wedding all over the internet...but such a lovely place for weddings as well! Right above was the ceremony! Ready for a wedding...I love weddings...they always remind me of ours and how I felt that day...brings back so many lovely memories and feelings! Moments after the ceremony...I mean stunning! Congratulations lovebirds! The first day...in true to myself fashion...I of course did my favorite thing...hit the spa baby!!! Awww...nothing pleases me more! This spa was so unique in that it was built into the hillside...The Cave they called it, which I referenced above. I went early to catch up on some work, totally forgetting the cave part, meaning no service...ha...so I sat by myself and listened to the water trickling...umm so bizarre...never do I just sit! Regardless, the spa was beautiful...love the interior design of the locker room and hallways etc. I love doing unique treatments, and it had been a while since I did a body treatment. I just had a facial and massage a few weeks ago when we went to Palm Springs, so I wanted to change it up. I chose the Uncork Treatment, because it was unique to Napa, and incorporated wine...yum...not for drinking thou. It started off with a grape seed scrub, followed by a rich wine and rosehip mud wrap, and ended with cabernet grape seed lotion. So much fun, and the room was stunning...see below. I always love to know every single thing happening, during my treatments, and I'm such a talker. I was so intrigued by how she was able to make this treatment work laying down, with the scrub, mask, rinsing off etc. The body treatments always amaze me...anyone else? It was such a great afternoon, more please...I can never have enough spa treatments! The workout room looked great, my husband used it and enjoyed his workout. I totally wanted to, but that first, no sleep, the night before, killed me, and I was desperate to catch up on some sleep. They have a wine tasting room on site, for their own wines, but we just didn't have enough time to do everything, but next time we will check it out. It looked fun and was right inside the cave. Besides the pool, Hartley's favorite part was the long hallways, and getting to run them (well her adorable version of running) She probably fell like 20 times, and if you follow me on Instagram and stories, you would have seen quite a few times that I caught her on camera....ha...sweet Baby H! She was so cute and funny, I'll always remember this random little memory. They also have a bocce ball court, right behind he main pool, which was so charming as well...we keep debating whether to add this to our backyard...I always love these...we are total game people. Doing Napa with kids, is pretty difficult, although not so much with babies. However, if you are a momma like me, that just can't bare the thought of not bringing your babies with you on vacation....this is for you! When Hartley was 5 months old, we all went to Sonoma. Babies are so easy to do things with...you are pretty much just timing out feedings and they can nap easily almost anywhere. Both places have services you can hire, and in Sonoma we hired a driver to take us to variety of vineyards so we could take baby with us. This way we could both enjoy the tastings. This time around, Hartley can't be worn, and isn't really allowed in probably most tasting rooms, for a variety of reasons. As a baby, we wore her on tours, everything...it was so easy and so much fun! Our driver even sat with her while we did one private tasting...she was the loveliest! We have a thing...anytime we see flowers we always stop, so I can let her sniff them...I love flowers, and always have fresh flowers in our home. Stop and smell the roses...literally...I think its so important to enjoy the little thigns in life! Hartley is now 26 months old, and soooo busy! Kids can't sit it on tastings...so we did it a little different. We got a late start this day, because we wanted to brunch with our friends, before heading out...so we didn't time out the kids naps like normal. When we travel, we are a little selfish in our parenting, and don't have structured naps and bedtimes like at home...otherwise, we would literally be in the room the entire trip. We went to our favorite winery, Silver Oak. I stayed outside with the children, and Hartley got to run around and be her silly self, which she had a blast doing. She kept wanting to go into the vineyards...which on the way out, we walked in a tad, to show her the grapes. My honey would go in for his tasting and bring it outside. I was not going to drink this day and be the DD. We have a similar palette for wines, so I trust his opinion, and we can just bring a few bottles back with us. Actually, this time of year it's still so hot, it's not a good idea so to travel and even ship wine (especially back to 110-120 degree Arizona). Therefore, we just decided to wait until it gets cooler and order online. No sense in buying an expesnsive $100 bottle and it being ruined due to temperature exposure...ugh the worst. This never gets old...I will never say, I've seen too many vineyards! We wanted to go to Grgich Hills Estate and Opus one....but Hartley, who missed every nap the previous few days, just fell asleep in the car, so we settled for driving all around and checking out vineyards from the car. Ha...so funny how things change. We still had to drive into Sausalito and wanted to explore there a little, so Napa was super short. We definitely would come back with a sitter, and have them watch the babies, so we can go explore all these other vineyards, and taste together. It was doable the way we did it, but we would have skipped brunch at the hotel and visited a few other vineyards instead. You could also hire a driver and take the littles, but like I said, probably most tasting rooms won't allow them in, so you have to kind of switch off with your spouse, going in and out...but doable! You definitely have to sacrifice somewhere, taking littles to Napa, and that's fine with me, because I'm just not there yet...traveling without my babies. We stopped at V. Sattui to grab a late lunch... of cheese...literally...I love cheese...give me all the cheese and prosciutto!! Highly recommend this place, it had literally the best cheese selection ever...see below. Omg I just wanted to buy everything. We didn't do any wine tastings there, just ate outside on a cute bench with a wine barrel as a table. They have dozens of picnic tables there too. Such a true Napa, picturesque, little vineyard and eatery. The dream spread! The raviolis weren't super intense in flavor, but...omg I'm forever craving two of those cheeses on the bottom plate!! I could eat like this everyday...actually there are many days that I do!! Afterwards, off we went to Sausalito and San Francisco, with 30 degree cooler temperatures. 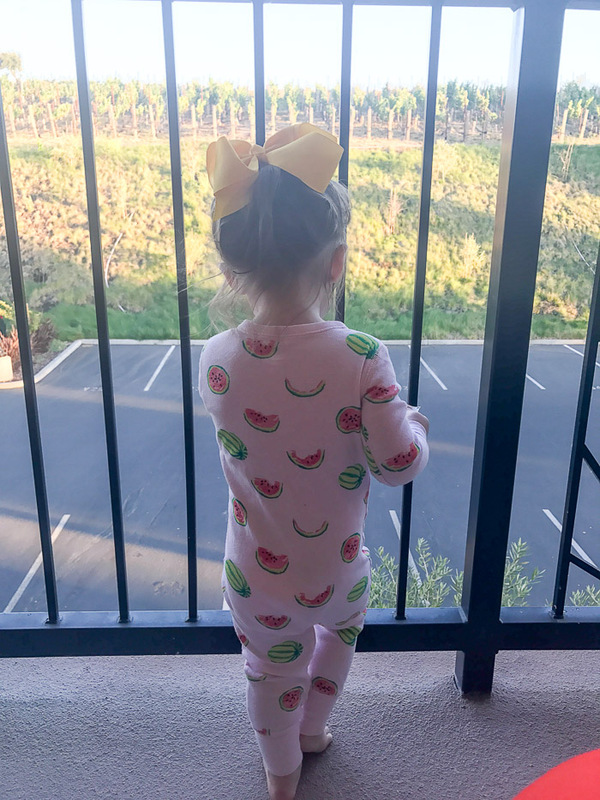 We loved our time at The Meritage Resort and Spa in Napa, and definitely want to come back and stay here in the future, and check out more vineyards! In collaboration with the The Meritage Resort and Spa.